Salinity measurements are an important aspect of soil, crop and environmental protection, research and management. 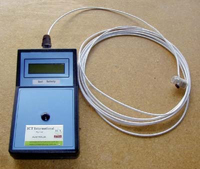 A new Salinity Meter manufactured by ICT International offers scientists and environmental managers a highly accurate, low cost, plug and play solution to measure salinity in the field. The system consists of a meter with LCD display and spreadsheet software. The Software allows conversion of the manually recorded values to soil salinity in dS/m for each individual soil salinity sensor.